Media captionThree properties in the Calder Valley have been flooded after a bout of heavy rain. Towns and villages in West Yorkshire have been hit by flooding in the wake of Storm Brian. More than a dozen flood warnings were put in place after gale-force winds and heavy rain hit the UK on Saturday night. But these have now been removed. Three homes and business were flooded in the Calder Valley, the Environment Agency said. Flood sirens were heard by residents in Todmorden, Hebden Bridge, Mytholmroyd and surrounding towns and villages. The agency said river waters had receded but further rain was forecast, though it did not expect levels to rise as high as on Saturday. It had earlier warned residents to be prepared saying more than 3,000 properties were at risk of flooding. A spokesperson said: "Our Leeds incident room was open to co-ordinate our response and teams stayed in the area overnight and into the early hours to keep watch as more heavy showers were forecast. "We're continuing to keep a watch on river levels." 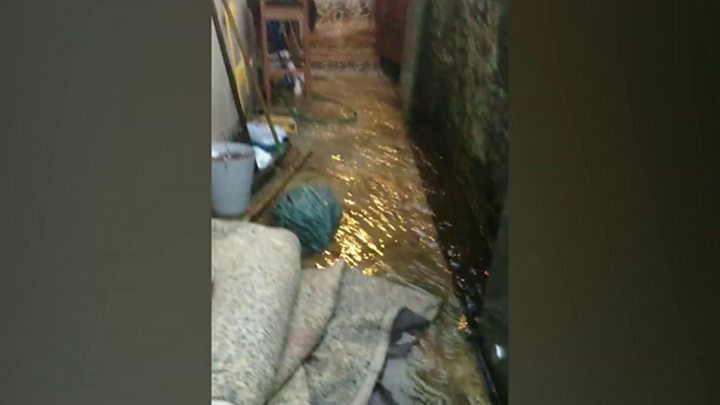 Martyna Krol said she went to help a friend who lives in Charlestown but the flood water had "gone down" about 21:00 BST. "We went to help as we know these two places - Calis Bridge and Charlestown - are the first ones to flood. "The river up Calis was full, so only the wall was holding it in. As to Charlestown, the water comes from the hill, and the new flood defences were useless and blocked with leaves, so water went straight on the road and up people's doors." Calderdale Councillor Rob Holden said: "The council and partner agencies were out in force as soon as water levels were approaching levels of risk. "They also had senior officers from both the police and fire brigade in the upper valley assessing risk which was great to see. It just goes to show that many lessons have been learned from Boxing Day 2015."